Engraved brass with silver inlay. 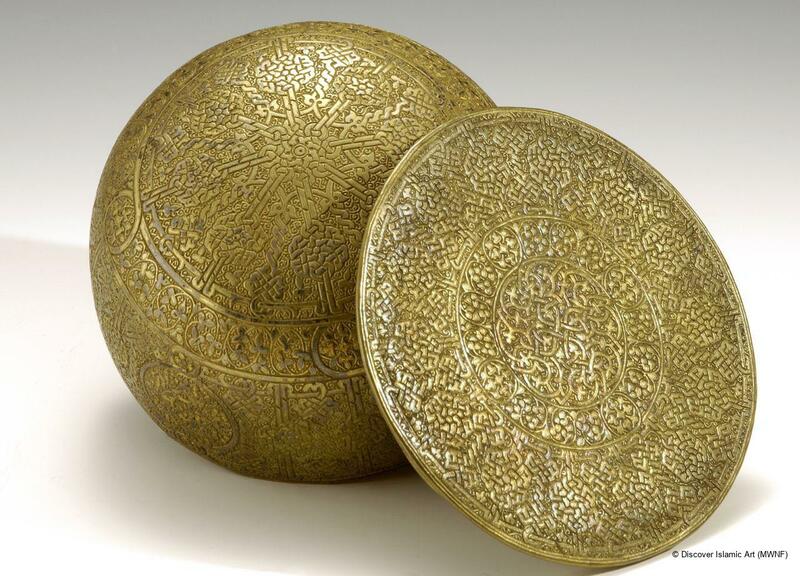 A lidded bowl made of cast brass, turned and engraved with interlaced arabesque decoration. It has a rounded bottom and a flat, tight-fitting lid. Though much of the silver inlay has fallen off, there are still some traces of it on the base and sides of the bowl. The inside of the lid has an engraved decorative roundel in its centre. As the lid fits tightly, it is believed that the container was intended to hold incense or spices. 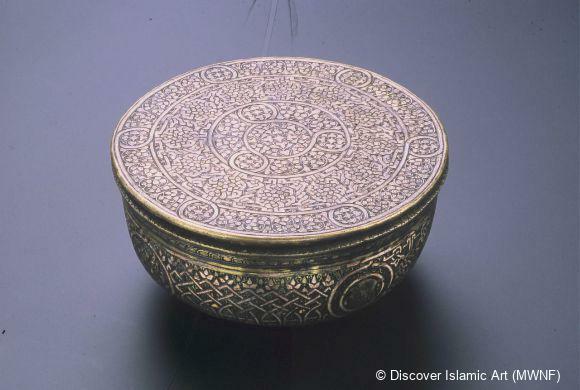 Although this box was made in Mamluk Syria, it was intended for the European market, specifically Venice. 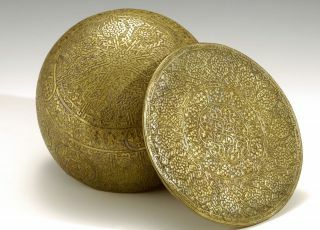 In the 19th century, scholars thought that this type of metalwork was made by Muslim craftsmen living in Venice, and therefore called it: 'Veneto-Saracenic', but research has since shown that such items were actually made in Mamluk Syria and Egypt specifically for export to the Venetian market. 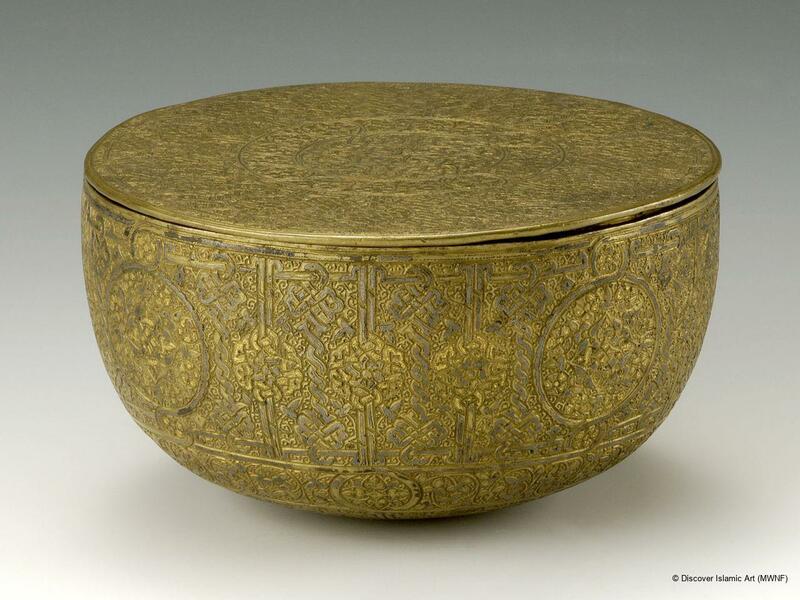 This round-bottomed brass bowl is covered with an interlaced arabesque decoration, which was inlaid with silver. It was most probably used as an incense or spice container, and made by Mamluk craftsmen in Syria or Egypt for the Venetian market. Artistic analysis and comparison with other examples of metalwork made for the European market during the 9th–10th / 15th–16th centuries. Purchased as part of a larger collection of items in 1883.